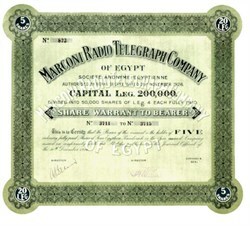 Beautifully engraved early 5 Share certificate from Marconi Radio Telegraph Company of Egypt issued in 1926. This historic document has an ornate border around it with the company's name on top center. There are also 3 unused coupons attached on the bottom. This item has the signatures of the Company’s Directors and is over 92 years old. Shows some signs of wear. In 1914 a Marconi radio station was built in Cairo, working in competition with the Eastern Telegraph Company's cables until the late 1920's when the two services were combined. Guglielmo Marconi was born at Bologna, Italy, on April 25, 1874, the second son of Giuseppe Marconi, an Italian country gentleman, and Annie Jameson, daughter of Andrew Jameson of Daphne Castle in the County Wexford, Ireland. He was educated privately at Bologna, Florence and Leghorn. Even as a boy he took a keen interest in physical and electrical science and studied the works of Maxwell, Hertz, Righi, Lodge and others. In 1895 he began laboratory experiments at his father's country estate at Pontecchio where he succeeded in sending wireless signals over a distance of one and a half miles, thus becoming the inventor of the first practical system of wireless telegraphy. In 1896 Marconi took his apparatus to England where he was introduced to Mr. (later Sir) William Preece, Engineer-in-Chief of the Post Office, and later that year was granted the world's first patent for a system of wireless telegraphy. He demonstrated his system successfully in London, on Salisbury Plain and across the Bristol Channel, and in July 1897 formed The Wireless Telegraph & Signal Company Limited (in 1900 re-named Marconi's Wireless Telegraph Company Limited). In the same year he gave a demonstration to the Italian Government at Spezia where wireless signals were sent over a distance of twelve miles. In 1899 he established wireless communication between France and England across the English Channel. He erected permanent wireless stations at The Needles, Isle of Wight, at Bournemouth and later at the Haven Hotel, Poole, Dorset. Between 1902 and 1912 he patented several new inventions. In 1902, during a voyage in the American liner "Philadelphia", he first demonstrated "daylight effect" relative to wireless communication and in the same year patented his magnetic detector which then became the standard wireless receiver for many years. In December 1902 he transmitted the first complete messages to Poldhu from stations at Glace Bay, Nova Scotia, and later Cape Cod, Massachusetts, these early tests culminating in 1907 in the opening of the first transatlantic commercial service between Glace Bay and Clifden, Ireland, after the first shorter-distance public service of wireless telegraphy had been established between Bari in Italy and Avidari in Montenegro. In 1905 he patented his horizontal directional aerial and in 1912 a "timed spark" system for generating continuous waves.